When it comes to making DIY home improvement projects easier to handle, these are the cool DIY tools I personally recommend. Also, if you're looking for a great gift for your special DIY'er, any one of these will surely do the trick. I've also included some essential Emergency tools no one should be without. DIY Tip: Also check out these great DIY gift ideas for your favorite do-it-yourselfer, and all under $10 bucks! 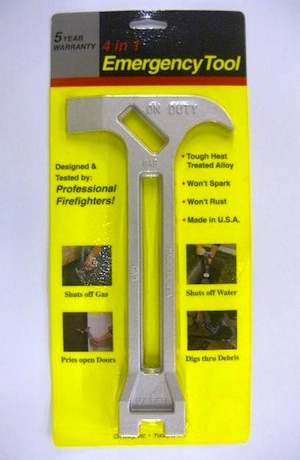 Although a simple wrench or pliers will turn on or off most water and gas supplies, the 4-in-1 emergency water meter and gas meter shut off tool is designed to quickly handle both. This versatile tool can also pry open doors and is excellent for digging through debris. Also, it won't rust or spark! 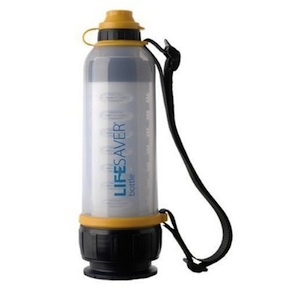 For easy access in an emergency, buy two and attach one to your water shut off and one to the gas meter. Five year warranty too. 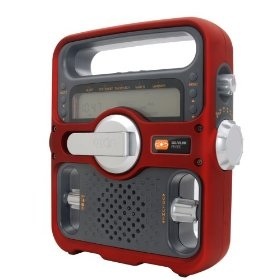 This is the one and only emergency radio you'll ever need. 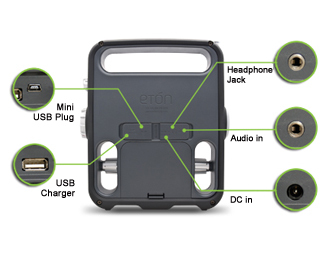 It's 3 way power (hand crank, solar and rechargeable batteries) won't let you down. 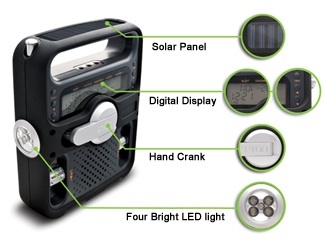 front details Includes multi band radio (AM/FM, Shortwave, NOAA, and S.A.M.E. ), flashlight, USB cell phone and MP3 charging. back details Always be in touch. 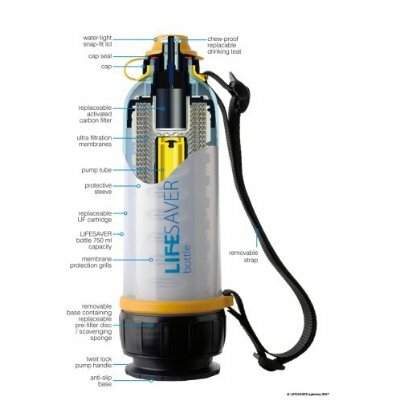 The bottle treats 750 milliliters of water in just under a minute. 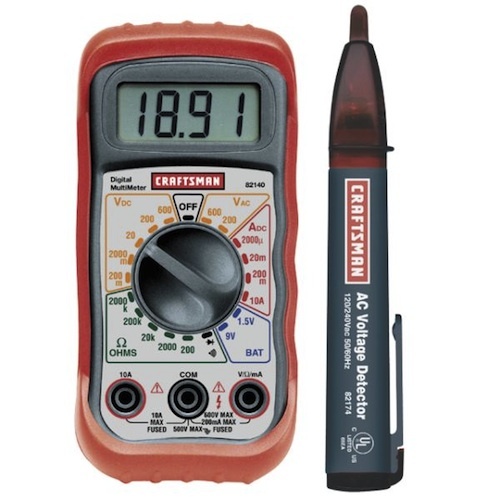 This digital multimeter is an excellent choice because it's so easy to use. It has an easy to read display, and an AC voltage detector pen for checking voltage with one hand. Make your electrical jobs easier and safer with this DIY cool tool. If you've ever needed a large clamp but didn't want to spend a bundle, then this is the clamp for you. 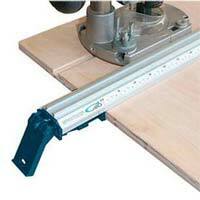 Not only does it function as an easily adjustable clamp, but also as a straight edge, and tool guide. Now cutting sheet goods, like plywood, is a snap. Just measure, set the All in one clamp and run you saw along the guide. 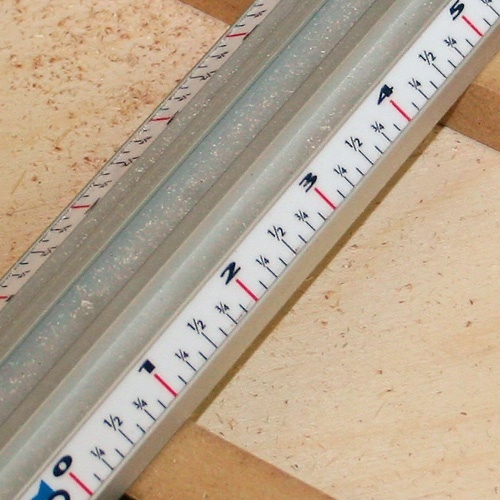 It's as easy as that.The full-color measuring scale with large numbers makes for easy layout and accurate cuts. Once you used this DIY cool tool you'll wonder how you got along without it. I've had a pair of these clamps for years and never stop finding uses for them. In fact I just bought another 6" pair just for my compound miter saw. They're excellent for holding the saw in place, or anything else for that matter. They're an extra pair of hands at your command. As far as sawhorses go I've owned many types. The ones you build with metal brackets, the metal fold up types, and many custom ones I've built myself. And they all had two things in common. They were are cumbersome to transport and heavy. 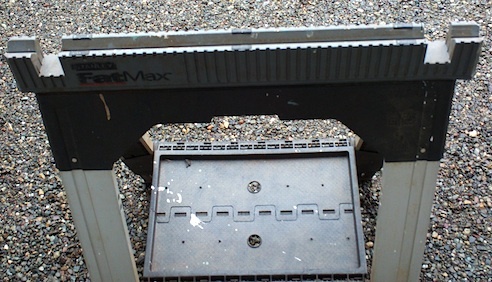 The Stanley FatMax sawhorses had caught my eye in the home center several times before, mostly because they folded up so neatly, and they were very light weight, but the price always seemed a bit high. only 2 inches wide, and are very light and easy to transport. As well, the individually telescoping legs make setting up on uneven ground a snap. The legs individually adjust about 8 inches each, from about 31 inches to a total height of 39 inches. 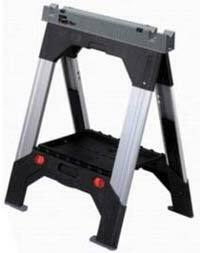 These Stanley sawhorses are also rated to hold up to 2500 lbs per pair! Geeze, now that's sturdy. They also have two 1 1/2 inch wide notches in the top of each horse to accommodate 2x4s to support planks for scaffolding, or your favorite work surface. I use a 24"X 60" oak cabinet door as a portable work surface (also light weight and easy to store). The built-in v-grooves are great for working with pipes and lumber, and the rubber feet prevent sliding on most surfaces. 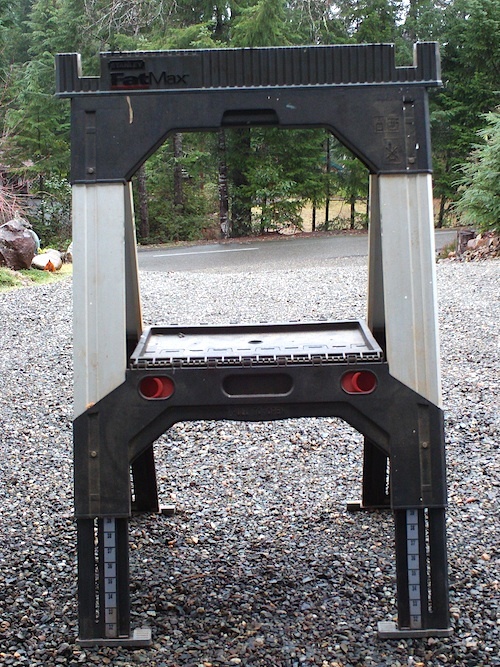 One often overlooked feature are the rubber pads built into the top of each sawhorse. These rubber pads help prevent your work surface or project from sliding on the sawhorses. An excellent touch by the designers. Believe me, these will be the last pair of sawhorse you buy, well except if you decide to buy a second pair, as I did. 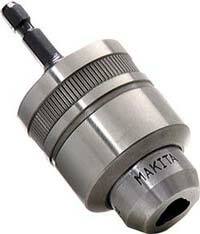 Easily converts an impact driver's 1/4" hex drive to a 3/8" keyless 3-jaw chuck to accept round shanked drill bits. It also has an all metal housing for great durability. Give your impact drive the ultimate flexibility and convenience. You've probably noticed that there are many different sockets and wrenches sets to choose from; 1/4", 3/8", 1/2", standard, and metric sockets. 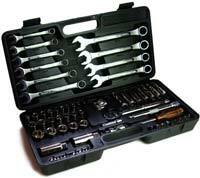 Open end wrenches, box end wrenches, and ratchet type wrenches. SIx piece sets to 3000+ piece sets, and the list goes on and on. With so many sets out there, you might ask yourself, "Why so many choices?" The answer is, they sell! Why? Because everyone is always looking for the perfect tool set for their needs. Believe me, there was a time when I had hundreds of sockets and wrenches, and three tool boxes to store them. Between their cost, the space they took up, the weight to transport them, and the time it took to find the right tool... ARGG!! What a hassle. But I'm happy to say those days are over! 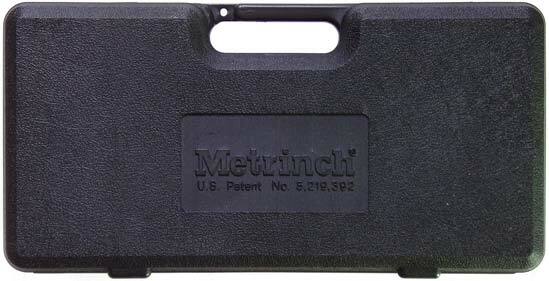 The solution is this 62 piece socket and wrench set, by Metrinch. This is the last set you'll probably ever buy. Both the sockets and wrenches grip the flat sides of the nuts and bolts instead of the corners. So, no more stripping nuts or bolts. Second, since they grip on the flat sides, one socket or wrench fits both standard and metric! Wow, only one set of sockets for any job... unbelievable. Third, and best of all, they also work on damaged nuts and bolts! I've had my set since they first came out and they're still good as new. They also come with a Lifetime Replacement Warranty. Check out this Metrinch video. 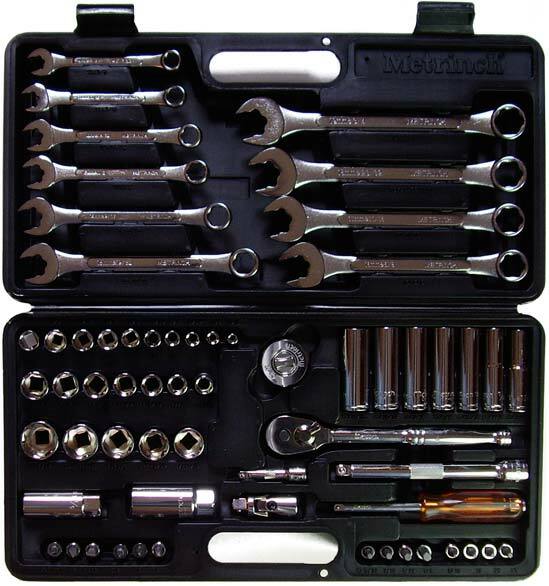 This incredible 62-piece socket and wrench set does it all, and comes in it's own custom carrying case. Once I tried these sockets and wrenches, I sold my three tool boxes of sockets and wrenches, and made enough money to buy a Metrinch set, and pocket a few bucks. Now that's a deal! I've owned my Metrinch set for about 15 years and they're still as good as new. Believe me, you'll love these tools! Other size sets are also available. Now here's a fantastic portable shop vacuum. This shop vac has all the power and portability you'll need, as well as a convenient wall bracket to store not only the unit, but all the tools too. It comes with a full compliment of 1 1/2 inch tools, which includes a 12 foot hose, two extension wands, 12 inch floor nozzle, brush and squeegee inserts, a crevice tool, and claw nozzle. The 5.5 horsepower motor, and two stage filtering system provides you with a system that you can count on. Plus don't forget the 4 year warranty. 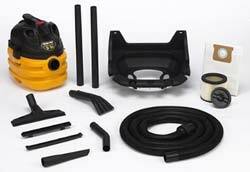 Wet or dry you'll have it all with this fantastic light weight package.